Molson Canadian 67 Sublime is not a great beer. It has very little colour, aroma and flavour. It’s bland and, frankly, kind of boring. The several bottles I had at the launch party that Molson threw at The Fifth last week are likely the last I will ever drink. Those are all the things that I, as a Serious Beer Drinker, am expected to think and write about beers like this. And in general, they’re all true. But they also don’t much matter, as Molson Canadian 67 Sublime – a low calorie and low alcohol beer infused with lime and lemon flavour – isn’t a beer for Serious Beer Drinkers, and what Serious Beer Drinkers think about it is pretty much irrelevant. It’s not a beer to be sniffed and sipped and swirled and savoured; it’s a light and lightly-flavoured beverage designed for calorie conscious consumers who want to enjoy a few brews on a warm patio with friends and not think about what they’re drinking aside from making sure it’s cold and refreshing. And there’s absolutely nothing wrong with that. Sure, I could pull out the argument that those who want to cut back on their caloric intake could just drink a less – and preferably craft – beer rather than settling for a low calorie macrobrew. But that assumes that the people who choose to drink 67 Sublime and other low-cal and lime-flavoured brews are settling, when in fact, many of them are likely quite happy with what they’re getting. Sitting on the lovely enclosed rooftop patio at The Fifth, chatting with friends and colleagues, and enjoying a sultry early summer evening, I drank one, and another, and another besides that. Sure, they weren’t as good as the Hacker-Pschorr Kellerbier I’d enjoyed at a nearby pub beforehand, or something else similarly full of flavour and character, but they were cold and wet and drinkable (sorry, Steve! ), and I was thirsty, and I drank them. 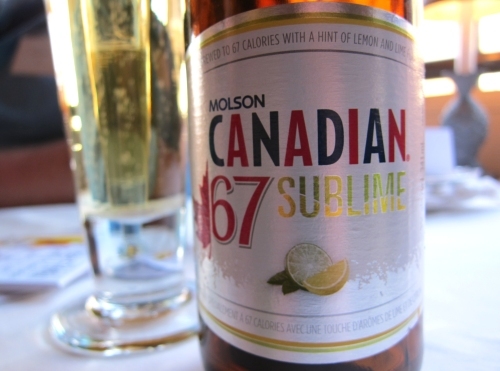 So for what it is, and who it’s made for, Molson Canadian 67 Sublime is a product that fits its niche perfectly. It’s just pretty clear that I (or any other Serious Beer Drinker) don’t really fit into that niche along with it. That’s not a passing of judgment, just a statement of fact – a fact that I’m fine with, and that I expect Molson is fine with as well. This entry was posted in beer reviews and tagged fruit beer, lager, light beer, macrobrews. Bookmark the permalink. I was thirsty that night too. I drank water. I got the better end of the deal. Be honest, Hon, that beer is a lowest common denominator drink for lowest common denominator people; the folks who truly believe the message behind mainstream marketing campaigns for sub-par products and who believe that their lives are better for it. “I’m on a patio, with a cold beer! Life is awesome!” Yeahhh… okay. I still say that a calorie-conscious consumer is better off drinking some sparkling water with a slice of lime. Zero calories compared to 67. Free, in most cases. And, added bonus, you don’t look like a stupid douchebag. Or – instead of drinking 3 bottles of watered down swill, have one good, flavourful drink for the same calorie trade-off, and really enjoy it, instead of pretend-enjoying it, which is about all anyone can do with the 67 Sublime. Even if my palate was distorted and it doesn’t actually taste like Irish Spring, I’m betting my other assessment of green Kool-Aid and cat piss is still pretty accurate. Sheryl – Oh, I’m completely on side with the idea of “drink one good drink rather than three mediocre ones”. Or “drink THREE good drinks rather than three mediocre ones,” for that matter. Ultimately, I’m just being begrudgingly realistic about the fact that there are people who subscribe to the low-cal lifestyle, and who enjoy light lime-flavoured beverages – or who allow mass marketing to make them believe that they like light lime-flavoured beverages. Either way, this is a product aimed towards them, and its success or failure will rest on their reaction to it, not my reaction, which be pretty much summed up with a shrug and a “meh”. You’re being far too generous. It was disgusting. I just read yours and Jonathans 67 Sublime reviews, both are quite similar, and I think you are both completely offbase. I spent the weekend at my parents cottage with my parents and my uncle. When I arrived, the fridge was stocked with Labbatts Lite and Big Rock Honey Brown. Not a single one got drunk, instead we enjoyed my homebrewed hefeweizen and smoked pilsner (great with the smoked Chuck Roast I made), as well as a few bottles of New Belgium Ranger IPA. I don’t push my beer on anyone, I offered a small sample, and they eagerly reached for more once their glass was empty. It was a real eye opener for them, beer will full flavour is not only extremely tasty, but can still be refreshing and “drinkable.” By the end of the weekend they were scoffing at the crap beer they had brought.